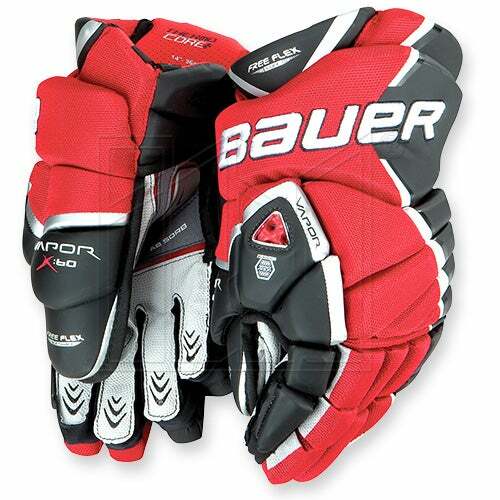 Bauer has introduced there new X60 glove. Images of the X60 have been floating around for a little while, but I was finally able to get my hands actually on a pair to do a quick review. The Bauer X60 glove is the top of line glove under the Vapor name. Bauer has focused on making the Vapor line the tapered glove line. It is more form fitting than a traditional glove but not as tight as the Supreme line. I think this glove feels slightly snugger than last years XXXX glove. Although, it does a nice job at opening up in the cuff, so wrist mobility should be no problem. Bauer has used a very unique palm construction. They are using a lycra base layer that offers a great flexible feel, that requires hardly any break-in. Bauer has also added a composite pad in the lower palm portion. This offers great durability in the high wear area but also absorbs vibrations to get you a solid grip. Check out the video review for more information, and be sure to check out icewarehouse.com and inlinewarehouse.com for more specs on the glove. This entry was posted in Protective Gear Reviews and tagged Bauer Hockey, Bauer hockey gloves, Bauer Vapor X60 glove, Bauer X60 glove, hockey gear review, hockey glove review, hockey gloves, IceWarehouse.com, X60 hockey glove on April 2, 2010 by Tyson.